Sometimes, you want to use iTunes just to listen to music, and not be bothered by the app's many other features. In this week's column, I explain how you can make a minimal iTunes, hiding many of the features you don't use. I also look at what you can do when you've got too much media to fit on your hard drive; how you can find (or not find) which songs you've "loved" on Apple Music; and explain how to fast forward in Apple's iOS Music app. Q: I only use iTunes to listen to music, and I find that there are just too many buttons in its interface. Is there any way I can simplify this? iTunes does have a lot of features. It handles many media kinds: music, movies, TV shows, apps, podcast, and more. And there's the iTunes Store, Apple Music, radio, and a whole lot of other features. 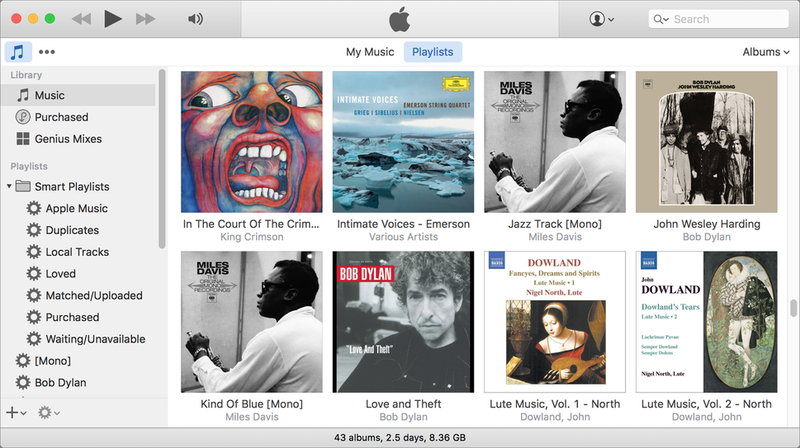 Fortunately, you can choose which of these features iTunes displays. If you're tired of seeing icons and buttons you don't use, you can hide them. When you do this, you also prevent accidentally clicking a button that takes you somewhere in the iTunes Store with no easy way to get back where you were. There are a few steps to take, but you may find that a minimal iTunes is a lot better for when you just listen to music. You can make iTunes into a minimal music player by tweaking the app's preferences and settings. If you want, you can re-add many of these features when you want to use them; it's only a few clicks to show or hide these buttons and icons. Q: Is there a way to create a smart playlist for loved songs which aren't added to My Music? This question is a follow-up from my last column, where I explained how to make a playlist of music you've "loved." You may listen on the go, and tap the little ♡ next to a track or album but not think of adding it to your library, or not have the time to do so. Unfortunately, there's no way for iTunes to create a smart playlist for music that's not in its library. Your loved tracks are recorded in your Apple Music account, but if you haven't added them to your iTunes library, then you may have trouble finding them. Apple Music should have a way of showing you all the music you've loved that you haven't added to your library so you can do so later. It uses these loves to fine-tune its recommendation algorithms, but it should also have a built-in playlist so you can go back and check which songs you rated. Fast forward by pressing and holding the >> button, which is surrounded by a red square. Scrub by dragging the playhead, which the red arrow is pointing at. Q: I recently switched to an iPhone. I am having a difficult time trying to find a good MP3 player that will let me fast forward through a song. Can you recommend something? 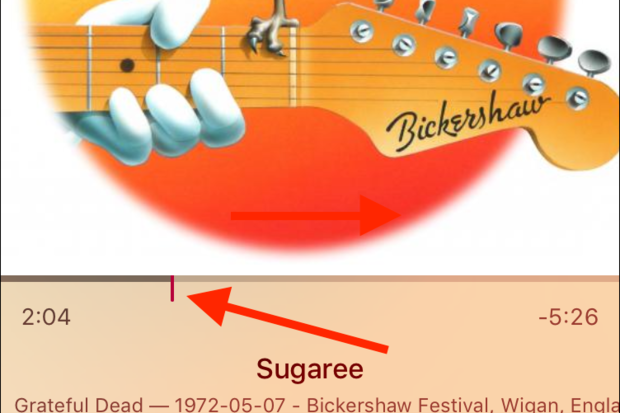 Pretty much every music player app on iOS, including Apple's Music app, allows you to do this. Just press the >> button and hold it; at first, the music skips ahead in small intervals, but if you keep holding, the scrubbing gets faster, and you can fast forward through a song a few seconds at a time. When you've reached the spot you want, just release the >> button. 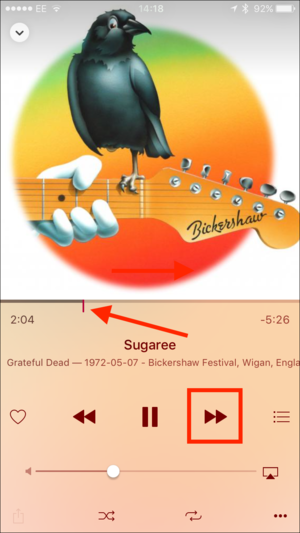 Note that you can also manually scrub through a track by dragging the playhead just below the album artwork. 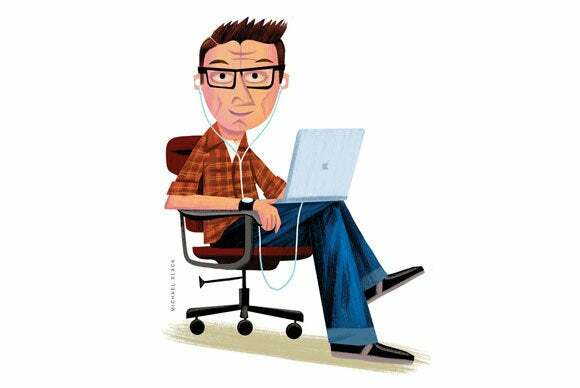 Q: I’ve filled up my hard drive with music, podcasts, movies, and TV shows. Can I put additional files on an external hard drive yet keep them in my iTunes library? You can, but the easiest way to do this is to move your entire iTunes library to an external hard drive. I explain how to do so in this article. If you don't want to move the entire iTunes library, what you might want to do is simply move items you don't currently need in your iTunes library to another drive. The files that take up the most space are movies and TV shows. Find the ones you don't plan to watch in the near future, then drag their files from the iTunes window to a folder on an external hard drive. Wait until the copy has finished then delete the files from iTunes. This said, if your movies and TV shows are purchased from the iTunes Store, and your internet bandwidth is fast enough, you might even want to delete them entirely from your iTunes library. You'll be able to re-download them again when you want to watch them, or even just stream them.